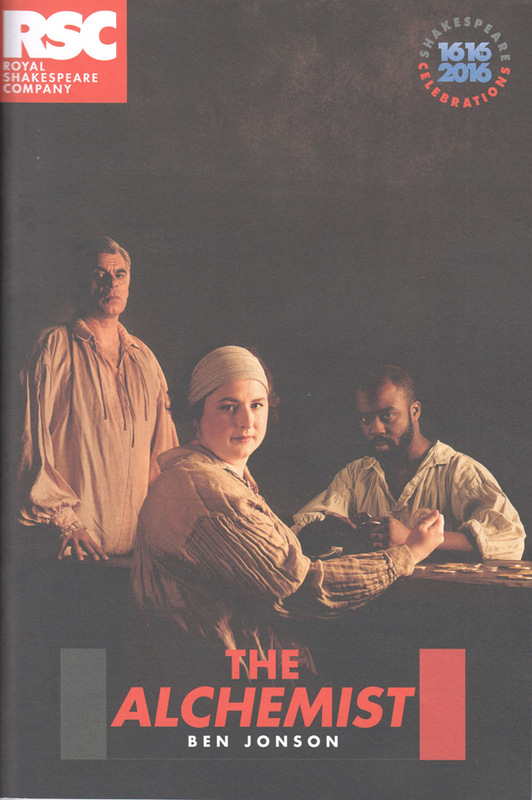 The Alchemist is one of Michael Billington’s The 101 Greatest Plays, in a book I often refer to. A friend said it was the RSC play he most wanted to see this season. Another said it was one of her all-time favourite plays. I hadn’t seen it on stage before, and I never thought it impressive on reading it, because far too much of it is contemporary Jacobean stuff, needing heavy annotation. It is aways heavily cut in production, and Stephen Jeffreys’ intro says it is cut by 20% or 4000 words. Mr Jeffreys wrote the prologue and modernised some text. At the Globe he would be credited as dramarturg, and have his name next to the director. Here he’s 13th in the list of creatives. This is a preview, and all credit to the RSC, a low-price preview at that, and they just do a couple of days, not a West End TV star three weeks. The opening overture by the band was impressively and hilariously eclectic with a huge mix of styles. After that, the music mainly didn’t fit at all. The actual production was “Sam Wanamaker Playhouse” in style. Jacobean costume, mainly fixed lighting, some flying of Doll, but they can do that at the Wanamaker too. When you look at the online photos, they all look like the Wanamaker- dark background, Jacobean costume. Fixed minimal set. No extra stuff brought on. No great SFX except for a firework fuse and impressive explosion near the end. Lots of smoke pumped around, too much and uneccesarily, I thought. It was extremely “straight.” No concept, except perhaps that for the curtain calls, Face undressed to reveal a Ramones T-shirt and then everyone came on in contemporary clothes. The other jarring piece of costume was that Face appeared to be wearing a flying helmet and goggles at times. The Anabaptists looked like monks rather than the comic puritans suggested by the name Pastor Tribulation Wholesome. Surely the puritans Jonson was lampooning were dressed in sober black (though maybe it was to to give Ananias comic belt twirling possibilities). Anyway, to me they looked wrong. Puritans were the Kings Men’s biggest enemy. This play dates from 1610, and next door in the Royal Shakespeare Theatre, Cymbeline dates from 1609 but was probably playing in 1610, and certainly was in 1611. So two contemporary pieces from the Kings Men. We also know that Ben Jonson believed in the classical unities of time and place, and was highly critical of the complex time and spatial shifts in the late Shakespeare quartet (Pericles, Winter’s Tale, Cymbeline, The Tempest) which were all done at the Wanamaker Playhouse this winter. There was a sense of competition. In 1610, the Kings Men took The Alchemist to the provinces, and garnered high praise in Oxford, in an indoor setting which was used as the basis for set design for The Globe’s authentic practices venture into Twelfth Night and Richard III with Mark Rylance. A comedy like Jonson’s, with its single set and use of only one level was well suited to an indoor hall like The Blackfriars and … Jonson had never made any use if the architectural freedom that was available at The Globe. He always seemed to work mentally for an indoor stage, although a successful play like “The Alchemist” would have been presented in both theatres. Both Coleridge and Dryden heaped the highest praise on The Alchemist. Dryden is responsible for some silly perceived “rules” on English grammar, so I’m not rating his opinion too highly. The plot? Basically, Lovewit has gone away leaving his house in charge of Jeremy, his servant. Jeremy becomes “Captain Face” and elists the help of two lowlife conmen, Subtle and Doll Common. They then hoodwink a series of “gulls” in various ways, though centrally by pretending they have The Philosopher’s Stone, which can transmute base metals into gold. The gulls begin with Dapper, a clerk (Welsh here), who wants to meet the Queen of The Fairies, who would swap fairy gold for coin of the realm. Absurd? In 1610 a pair of conmen were arraigned for selling such meetings, and four years earlier a gentleman of Dorset paid a con artist £6 for such a meeting. Then Abel Drugger is a tobacconist seeking some sort of 16th century version of feng shui advice about his shop. Here it’s seen as astrology, but we’d call it feng shui. Then Sir Epicure Mammon seeks the Philosopher’s Stone, but is in a ‘sensuous drugged trance in which he can see a whore like Doll and consider her worthy to be hung with diamonds‘ (Marchette Chute again). Two Anabaptists from Holland want to increase the money they’ve collected from the orphans. They hate any sign of worldly show. I don’t know what happened here, but neither of us cracked a smile from beginning to end. It just wasn’t funny. There didn’t seem to be a comic touch in the direction, nor comic timing in the acting and very, very little of the text amused us at all. It may be contrast with two far better Globe productions (Taming Of The Shrew, Midsummer Night’s Dream), and a fabulous Kenneth Branagh production of Romeo & Juliet last weekend. Maybe they raised the standard too high. I’m hinting unsubtly that I’m on Shakespeare’s side in the 1610 debate on Jonson’s “real people in real time” versus Will’s “away with the faeries.” Or if you like broad satire like Monty Python plus contemporary realism in Eastenders (Jonson) versus Game of Thrones (Shakespeare). In many ways this production, unlike the RSC’s recent Volpone, was too unadorned with concept (and I have complained about extraneous, imposed concept in the past). I felt it needed some central idea, some definite approach rather than just doing the play. The play is also unbalanced, with five or six very good actors from the Swan season appearing briefly as “neighbours” to call out to Goodwit when he returns, and to do so from various points in the theatre. Then two or three just stand around as officers. A terrible waste of under-employed acting talent … especially as it could be scripted as just one neighbour if economy is considered. If you’ve got them, you should try and use them earlier … not that the play has room for anyone else with its fixed single set. I’ve seen a lot of Jacobean / Elizabethan plays on stage for the first time. I’ve always read about them thoroughly in advance, and had often read the plays in my student days. I found The Alchemist hard to follow. My companion, who insists that the RSC synopsis should always suffice if the production is any good, said she couldn’t work it out at all, and added that mumbled lines from the rogues did not help. One event in the play that articles note is Dapper. Early on he is gagged and locked in a privy. Then everyone forgets all about him, He eventually chews through his gag and gets out right near the end. Good Farce 101 stuff. But what did they do here? Led him off along one of the thrust walkways. He didn’t seem about to be locked up (I missed the words if so). When he emerged along the walkway an hour later, you had totally forgotten who he was and why he had a gag round his head. Didn’t work in the slightest. (Sigh) if you have someone locked in a privy, you see the privy on stage, you hear odd knocks and noises. The “lockers in” do a double take, or hurriedly talk over the noises. The door rattles at times. It’s a classic farce running gag. Not here. Thrown away. Clueless farce direction. Sorry. I thought my critical edge had gone last weekend, rating two plays in a row at five stars, but no, they were that much better than this. You shouldn’t rate a preview, but this was two stars for us. Post-preview they might smooth it out and work on comic timing and gain one, but in the end it’s a pedestrian version. BTW, the Evening Standard calls it “pure gold” and gives 4 stars. As do The Guardian and Telegraph. I’ll note others as they appear. I love seeing different versions of plays, but the overall effect of this one means I won’t bother with The Alchemist again, unless it’s directed by someone I really admire. One of the 101 Greatest Plays? Not in this version. Cymbeline, 50 yards away next door, is a far better candidate.